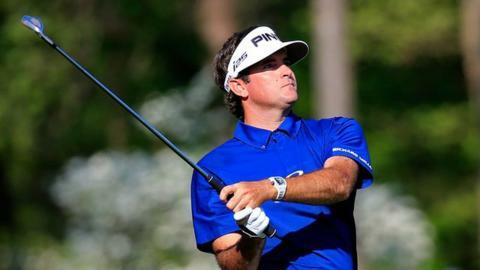 Former champion Bubba Watson says he will be as nervous as debutant Jordan Spieth when the pair tee off in the final group in the Masters on Sunday. Watson, who won the Green Jacket in 2012, faltered in round three as rising star Spieth, 20, joined him in the lead at five under in his first major at Augusta. "Jordan Spieth said he will prepare for the final round by hanging around with his friends, playing table tennis and pool and have a gym session in the morning. He guaranteed that he will have enough energy. "That sounds like one of those bar-room decathlons. Except that the final discipline is winning the biggest tournament in golf." They are one shot clear of another debutant, Jonas Blixt of Sweden, and their fellow American Matt Kuchar, who is bidding to win his first major. "We are all going to be nervous," said Watson. "We all know what it means to our career, for our status to move forward in the game. It's going to be tough for everybody, not just guys that have never won one." Of the 13 players under par, only Watson, 2003 US Open champion Jim Furyk, 2013 US Open champion Justin Rose and 1992 Masters winner Fred Couples have won a major. "If I play bad, I still have a Green Jacket, so that's the positive I have to go for," added left-hander Watson, who beat Louis Oosthuizen in a play-off two years ago. Watson and Spieth will tee off at 14:40 (19:40 BST) on Sunday in the knowledge that 19 of the last 23 Masters winners have come out of final group, but none in the last three years, with Charl Schwartzel (2011), Watson and Adam Scott (2013) the exceptions. Left-hander Watson admitted he was desperate to par the 18th on Saturday to ensure he was out last on Sunday. "That's where everybody wants to be on Sunday," he said. "You know the roars, you know the history of the game. It's a lot better making that putt to win when you're in the last group than having to wait." Spieth said it is a "dream come true" to be in contention but insists he is at no disadvantage because of his inexperience. The Texan, who was named PGA Tour rookie of the year in 2013, would take over from Tiger Woods as the youngest ever Masters champion if he were to win - Woods was 21 years three months when he won in 1997. "It is about seeing how I can control my game and emotions out on the golf course against guys that have won here recently," said Spieth. "It doesn't necessarily mean, I don't think, that they have an advantage in any way. I'm very confident in the way things are going, and really looking forward to seeing how I can perform on a Sunday. "You draw on memories of guys that have made the putts on the last hole, from Phil to Tiger to last year with Adam on 18 and then on 10. You just dream of what it would mean and how cool it would be, and all those putts I hit when I was real young with my friends on trying to make it to win the Masters." Veteran Couples, 54, is four strokes back and could become the oldest player to win the Masters, beating Jack Nicklaus who was 46 when he won his sixth Masters and 18th major in 1986. "I have a shot of shooting something silly to win but it's going to take a 65 or 66," said Couples, who has had four top-15 finishes at the Masters since turning 50.